Fixity is an application for use with an Archivematica Storage Service installation. Fixity is run from the command-line and will check the checksums of AIPs in storage as a means of verifying the integrity of the bags. Fixity can also be configured to POST reports to a remote service after completing every scan. It also retains an internal database which keeps track of every AIP it has scanned and a report of every scan. 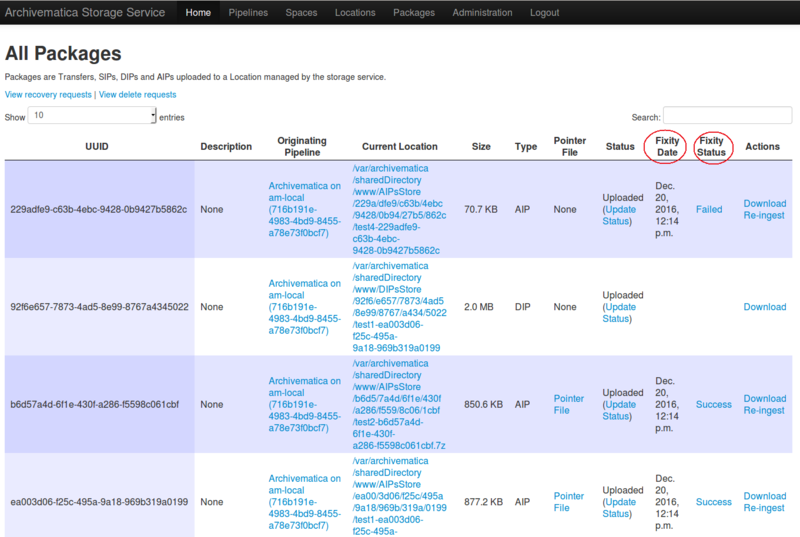 The Archivematica Storage Service displays these reports in the Packages tab; see reporting, below. Checkout or link the code to /usr/lib/archivematica/fixity by navigating to /usr/lib/archivematica/` and cloning the code. Once this is complete, the directory /usr/lib/archivematica/fixity should exist. Navigate to the home directory and switch to root. Then create a virtualenv in /usr/share/python/fixity and install Fixity and dependencies in it. Create a symlink from the executable to /usr/local/bin. You must still be logged in as root. You are now editing the environment variables file. You should use the URL of your Storage Service, and the username and API key of one of your Storage Service users. Replace the URL, user and key with your data. Finally, load the variables from the file. Run Fixity with sudo or as root the first time. Subsequent runs can be with any user. Exit the virtualenv and root user. The first time you run Fixity after the initial install, load the variables you defined above and set Fixity to scan all AIPs. Fixity is run from the command line after installation as per the instructions above. --throttle: add time (in seconds) to wait when scanning multiple AIPs. This can help reduce extended disk load on the filesystem on which the AIPs reside. --force-local: some types of Storage Service spaces (e.g. Arkivum) have a space-specific way of performing fixity checks. Using force-local forces the use of the Storage Service for the fixity check, rather than using the space’s internal fixity method. debug: add extra debugging output. Click on the Fixity status for an AIP (either “Failed” or “Success”) to see the history of fixity checks. The history page will show the time and date of the fixity checks and the error, if any.